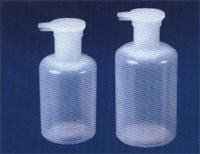 Blown in Low Density Polyethylene, this bottles dispense small uniform drops of liquids when pressed lightly. Pilot Scientific Works is an Indian company which came in light in 1975 dealing in scientific instruments Initially company worked as whole sale supplier’s into the Indian market and now company has expanded its business abroad. Over the years, company has built up its reputation by dint of technical knowledge, prompt replies to sale enquiries and prompt deliveries. Our company is dealing in a wide range of products of Physics, Chemistry and Biology And provide total solution in field of Educational Equipments. This new addition of our Catalogue will provide our valued customers an idea of quality and range of products which is continuously adding in view of everchanging demands of our valued customers. With pleasure, we express our thankful graditude to our present customers for their best and useful contribution towards our progress and growth. We welcome new customers for entering into business relationship with us. We always look forward for valuable suggestions from our customers and continously endeavour to provide best value for their money. We are committed to Quality and Services. Let us grow together and reach the new heights.